"The Power IT Operational Analytics Solutions"
IT operation’s analytics has really become powerful as it allows you to identify trends and gain insight into cause and effect that ultimately helps to prevent Service Disruptions with its operational intelligence technology. So how can Operational Analytics be effectively used to improve IT operational excellence? How can an IT Operations Analytics system help you to make better decisions through operational intelligence? And most importantly, how can it help you to prevent downtime and service disruptions? 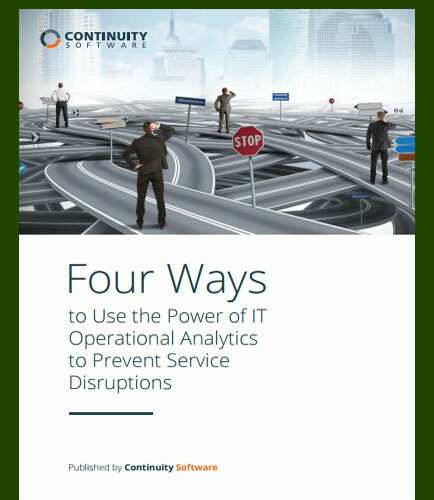 Read this whitepaper to know about the “Four Ways to Use the Power of IT Operational Analytics to Prevent Service Disruptions” and take the crucial step towards effective analytics. Prevent IT Service Disruptions: Detect issues and fix potential problems before they impact your business. Transform your operational intelligence insights into operational improvements. Recognize Patterns that Can Lead to Failure. Define and Measure KPIs for continuous process improvement meet organizations objectives.